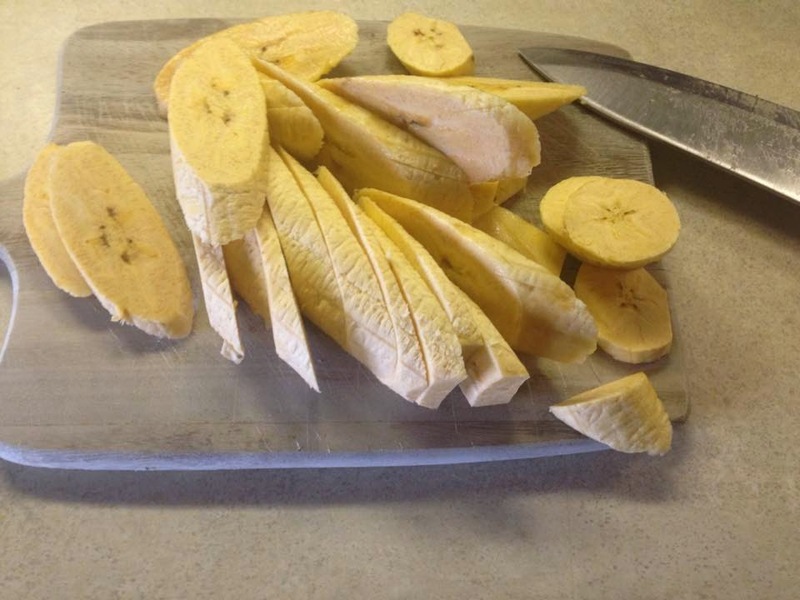 Step 1: Peel your plantains and slice diagonally. 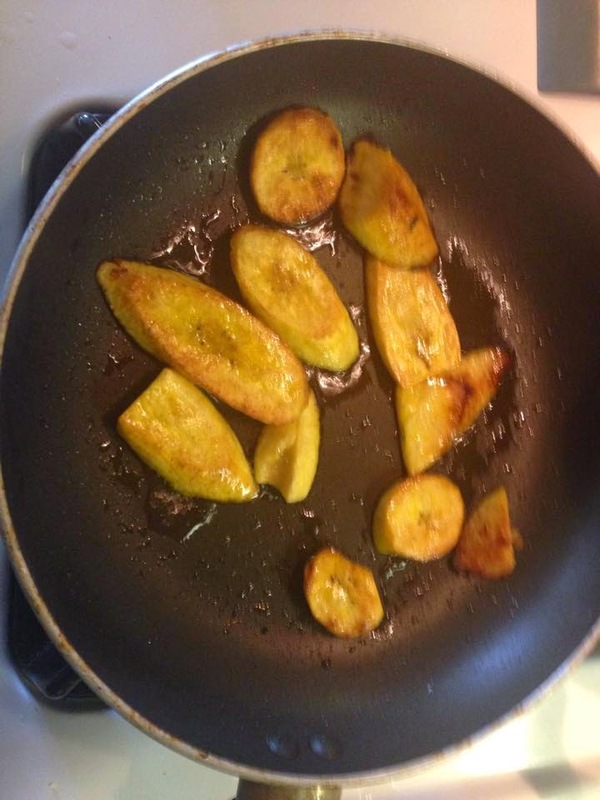 Heat some oil in a skillet on medium-high and add your plantains. Toast them on each side until they're nice and golden. You don't want to cook them all the way through because they will be baked later. Remove and place on a paper towel and let cool. If you are familiar with Latin American cuisine, you're basically making "maduro frito" or "madurito frito", if you're Nicaraguan. My mother used vegetable oil back in the day, but I find coconut oil to work just as well, and it's much better for you. Step 2: Place your cooled plantains in the food processor. This is where it gets a little tricky, and depending on the ripeness of each plantain, you may need to modify. Pulse until the plantains begin to resemble dough. If the batter looks too crumbly, add some cashew butter and/or water. You want to form a ball of dough that can be rolled out. 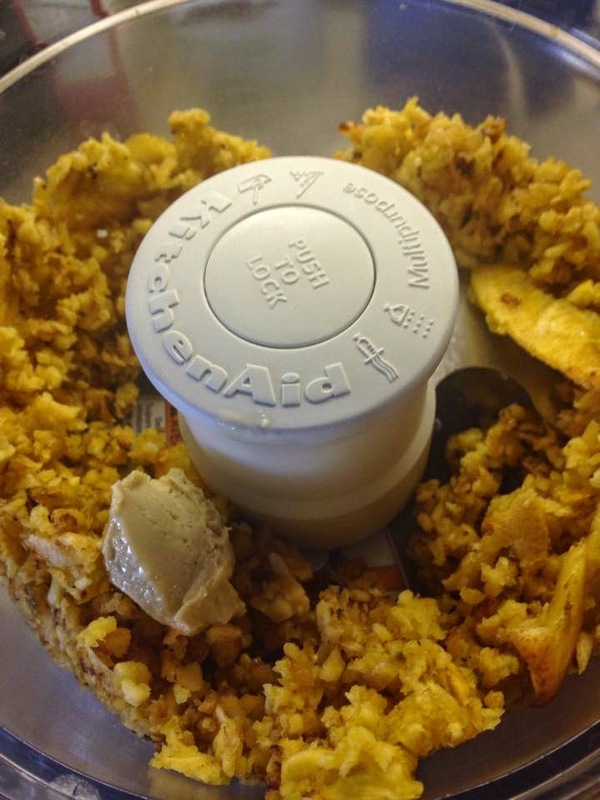 The cashew butter (peanut/almond butter work well too) and water help bind the plantain together. Add in 1 tablespoon at a time, pulse and analyze. 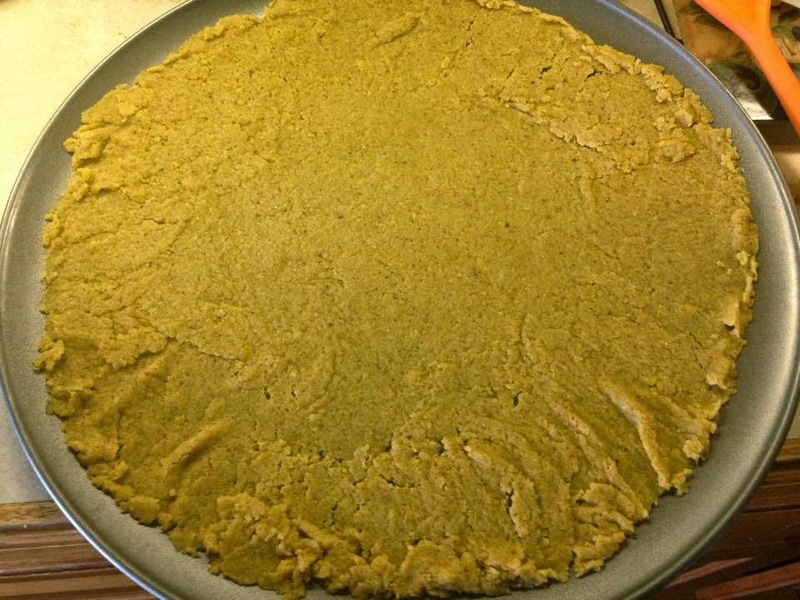 I used 2 tablespoons of cashew and 2 tablespoons of water and my "dough" was the perfect consistency. Step 3: Carefully remove the dough from the food processor (don't cut yourself on the blade - not that it ever happens to me or anything ) and knead it. Work it. Give it some love till it's nice and smashed together. Place in the center of a pizza pan. Use a rolling pin and roll as evenly as possible. I like a very thin crust. Bake on 375 for 10 minutes. 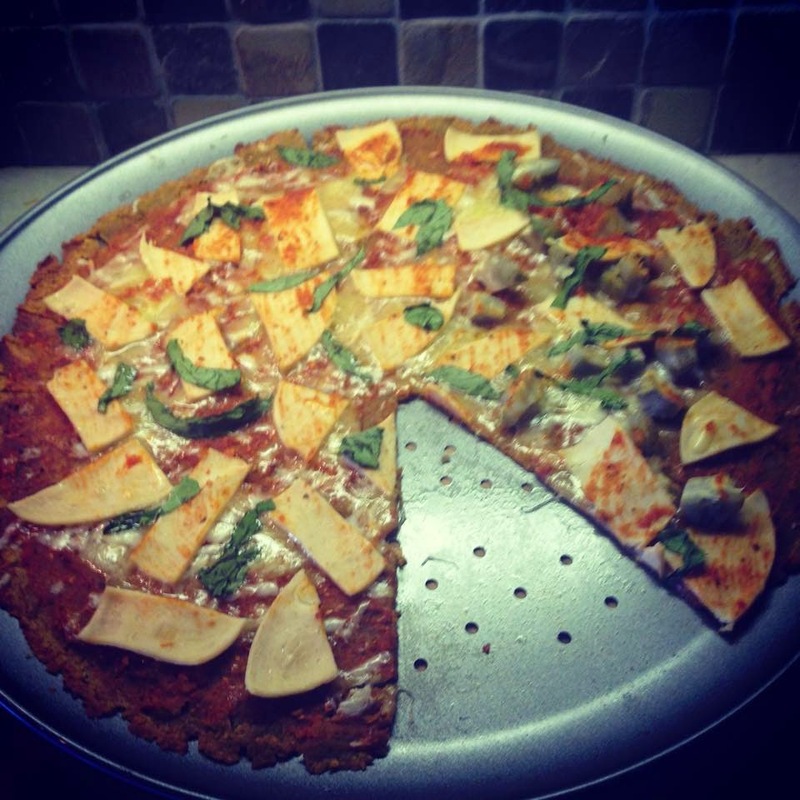 You may also use a cookie sheet or pizza stone. Depending on the size of your pan and thickness of the crust adjust cooking time. 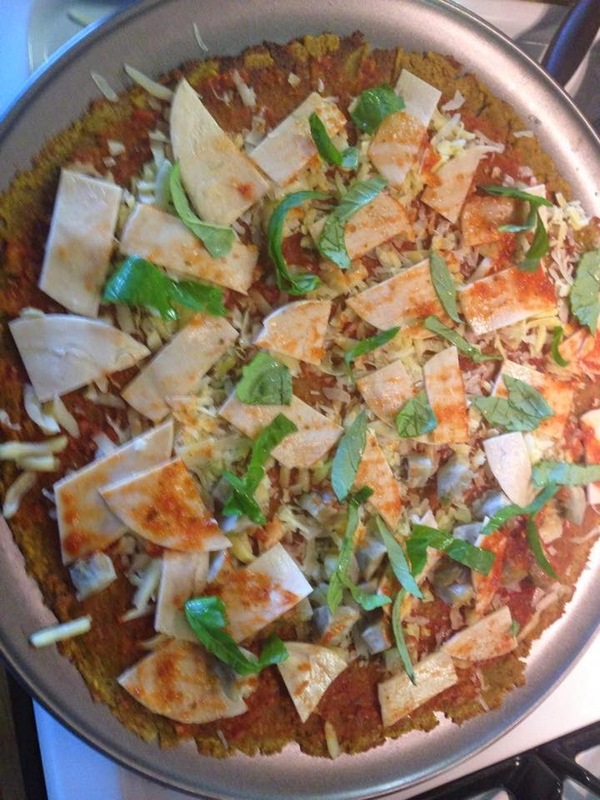 Step 4: Remove from oven and add your favorite pizza sauce and toppings. I poured half a jar of Wild Oats organic pasta sauce into the food processor. I added 3 garlic cloves, pepper, and a couple drizzles of agave because I like it sweet. I blended all together for a few seconds. Generously coat the crust. For toppings, I grated some grass-fed white cheddar cheese and parmesan. I added artichoke hearts, sliced deli chicken (I like the Harvest brand) and fresh basil. I put it back in the oven for about 5-7 minutes until the cheese melted. Check out those crispy golden edges...YUM!! I ate the first slice before I could get a picture...sorry. It's so good, ya'll!! If you try this recipe, let me know!! I'd love to hear about it."